In honor of New Orleans, a crab boil was called for Labor Day weekend in the Mission. 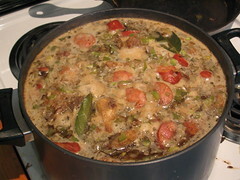 I volunteered to bring some gumbo and foolishly bought a bunch of okra-- looking at recipes after getting home, I realized that recipes for game bird and andouille gumbo used roux, not okra, for thickening. Anyway, after getting some andouille and game hens, I got to work. 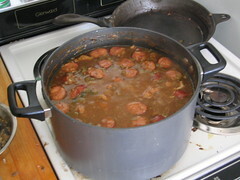 I mostly followed a recipe from Paul Prudhomme's Louisiana Kitchen-- the recipes are complicated, and the results are well worth the effort. 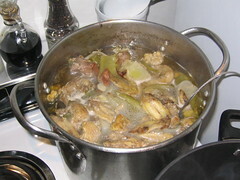 Here's the stock simmering away. The biggest piece of work was sectioning the four game hens-- I'm OK with a chicken, but these things were small and there were four of them. I had to do it fast because the stock depended on roasting those extra bits-- innards (but no liver), necks, backs, wing tips and splits, etc. 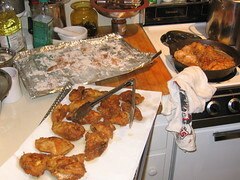 The hen parts were seasoned, dredged in flour, and fried for a few minutes per side to get a golden finish, but not cooked through. Some of the frying oil was saved to make the roux. Some of the trinity (New Orleans mire poix: onion+celery+pepper) cooked in the roux off the heat, and the mixture was stirred into the stock to start thickening, and and then everything went in. 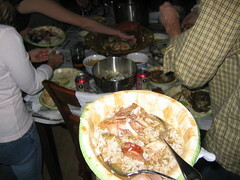 Bringing it over to Mike's, we all ate boiled crab and shrimp with some gumbo on the side. And beer-- lots of beer.